Chelsea manager Maurizio Sarri has explained what he felt was the most worrying thing about his side’s 2-1 defeat to Wolves on Wednesday night. Sarri’s side were dealt their second loss of the season, with things seeming to fall apart a little at Stamford Bridge despite such a strong initial start under the Italian tactician. Chelsea have won just four of their last ten Premier League games, and now look to be surely out of the title running after slipping to fourth in the table, a whole ten points behind leaders Manchester City. 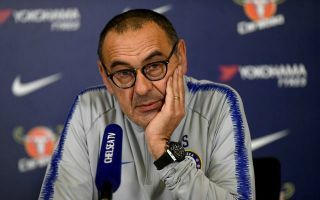 While there seem a number of areas of concern for Chelsea right now, Sarri says the thing that worried him most about the Wolves defeat was the lack of response from his players to their equalising goal. The Blues seemed to fall apart after that, and Sarri insists that dip in performance and lack of ability to deal with the first goal is more worrying than the final result itself. ‘I think that we played very well for 55 minutes. After the first goal, the 1-1, having been in full control of the match, we were suddenly another team,’ Sarri is quoted in the Metro. ‘Without the right distances, without our football. I don’t know why. ‘But I am really very worried, not for the result but for the fact that we did not react to the first goal of the opponents.